Over-temperature thermal shutdown, over-current shutdown, and under-voltage lockout. voltages above your stepper motor's rated voltage to achieve higher step rates. Flexible: 1pcs RAMPS 1.4 Controller Board+ 5pcs A4988 Stepstick Stepper Motor Driver Module with Heat Sink on your Arduino-compatible MEGA shield for easy service, part replacement, upgrade-ability and expansion. RAMPS 1.4 expansion board as a driver expansion board, can be used for engraving machines, 3D printers and it is a total of five slots, can drive five A4988 stepper motor. Update High Quality Ramp Board by changing MOSFET: old MOSFET IC Model : PDF55N06 * Specification：VDSS:60V ID:55A New MOSFET IC model: HM60N06 Specification：VDSS:60V ID:60A HM60N06 current up to 60A，More safety Each road stepper motors only need two IO ports. Stepper motor wiring as follows: 2A, 2B is a group (red, green), 1A, 1B is a group (blue, yellow), if want to change direction, can be change the position of one group , for example 2A, 2B mutually exchanged. 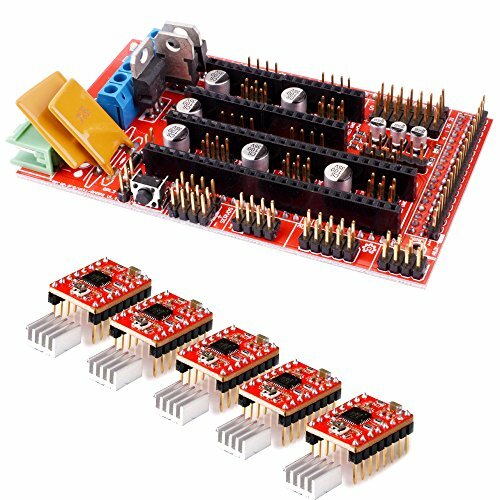 Using This suite (1pcs RAMPS 1.4 Controller Board+ 5pcs A4988 Stepstick Stepper Motor Driver Module with Heat Sink on your Arduino-compatible MEGA shield for easy service,part replacement,upgrade-ability and expansion.